Writing a book. If you write a blog with any kind of regularity, the idea has probably flitted across your mind at least once. Seeing your name sitting on the shelf with your favorite authors – I would imagine that’s a dream that many of us who sit at our keyboards have, at least in passing. Anna Todd began her journey on her phone, writing simply as a hobby to pass the time between appointments. She had no plans to publish when she began working on After, but as time passed, she combined her love of reading and her love of One Direction to start work on her fan fiction After, featuring Tessa Young and her on-again, off-again relationship with Hardin Scott, based on One Direction’s Harry Stiles. Anna began publishing short segments of her story on Wattpad, a free writing app. Eventually her story expanded to more than 2500 pages and has received more than a billion views. The book has been picked up by Simon & Schuster as a four book series, releasing in October. Paramount Pictures has acquired the movie rights to the story. Wattpad allowed Anna to write in the time that she had available and to publish on her own schedule. Wattpad allows readers and writers to connect in a social environment right from their mobile devices. Regardless of your experience as a writer, Wattpad allows you to share your stories with more than 40 million readers. You can purchase After by Anna Todd at Barnes & Noble: http://w.tt/wp or on your E-reader: http://w.tt/sns2. 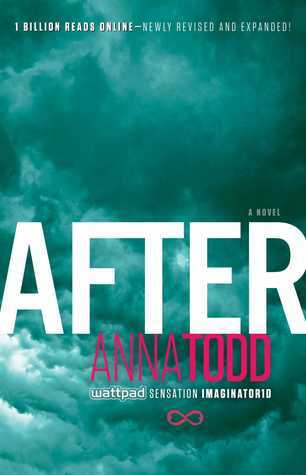 I participated in the After by Anna Todd blog program as a member of One2One Network. I received compensation but all opinions are my own. This entry was posted in Books, Sponsored, Writing. Bookmark the permalink.